Capacity 6 - 8 qt. Lock in your food's freshness with this Cambro RFSC6148 snap on cover! This tight fitting translucent polypropylene cover is for 6 and 8 qt. Cambro round, white storage containers. Its tight seal works to keep foods and ingredients uncontaminated and organized for your convenience! Absolutely a great set when paired with the 6 at storage container. They are strong, durable and hold up extremely well. Can't beat the price either! Smart buy. 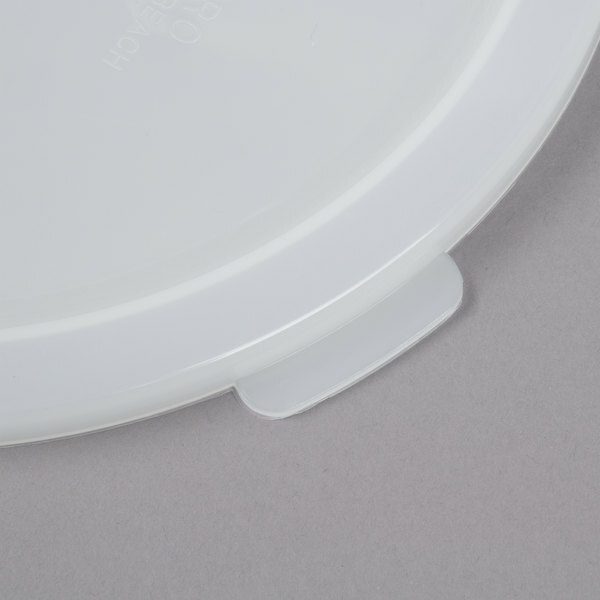 It is very important to buy the right tools to do the right work, that is why this white round lid must be part of your list if you are buying containers. The 8 quart container/ lld combo is perfect for my roasted coffee beans. I am able to measure, stack, and transport with confidence. The lid is strong and snaps on for a tight, confident fit. How perfect! These fit some existing plastic tubs that were here when I purchased the bakery. I looked high and low for the lids with no luck so I was happy to find these as a perfect fit! Tight and secure fit, perfect for transporting liquids or sauces. Does a great job at holding the temperature of a product when storing or transporting. 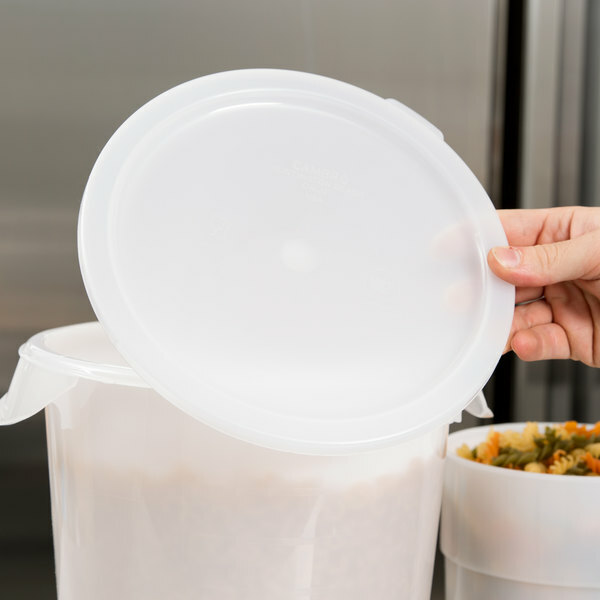 We highly recommend purchasing lids for all your food storage containers. 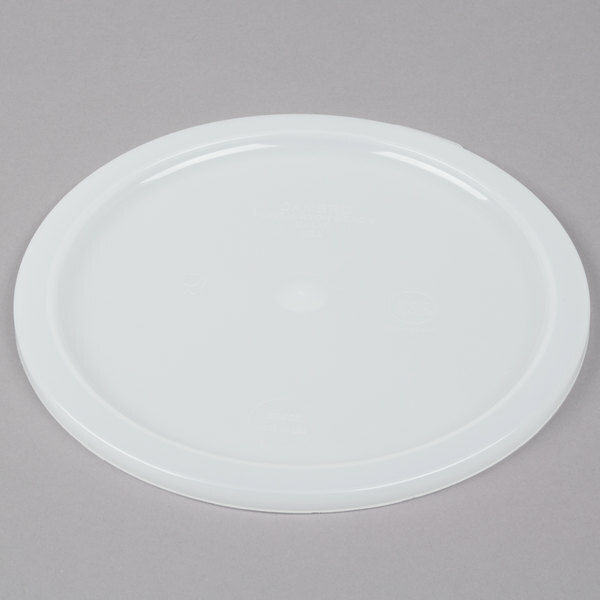 This is a white lid that will fit 6 and 8 quart round food storage containers. The lid has a tight fit and will ensure your contents remain safe and uncontaminated. I purchased the Cambro lid for my 6 qt food storage containers, the lid is well made and sturdy. It fits the container snug and I won't have to worry about spills. Perfectly paired with the matching lid, I live these storage containers. I plan on purchasing many more in this and other sizes, great quality lid for a great quality product. The Cambro RFSC6148 6, 8 Qt. White Round Lid is a perfect fit for my container. The quality is excellent and the price is very reasonable for a replacement. The seal is very good. I definitely recommend this lid. These lids fit very nicely on the Cambro 8Qt. containers that we also purchased. They were easy to put on and easy to remove. There was no leaking. They washed very nicely with basic dish detergent and water. I was very pleased with these lids. Would definitely recommend these along with the 8qt. Containers. Lid for Cambro RFS6148 6 Qt. Round White Food Storage Container and it fits perfectly. I use this to cover my container that holds my bread dough. 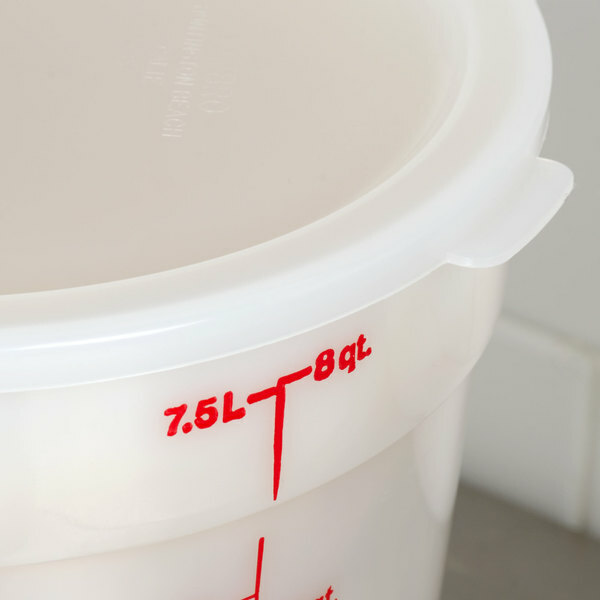 A must have if you are buying the associated 6 qt round white food storage container. These lids work perfectly on my 6 qt. Cambro containers. 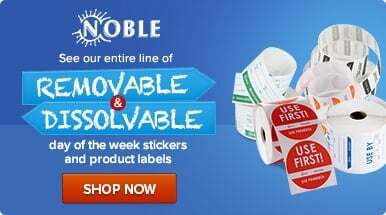 They seal well, but are easy to remove when I need to. The "White" lid is still somewhat translucent, but much less so than the actual "translucent" lids are. 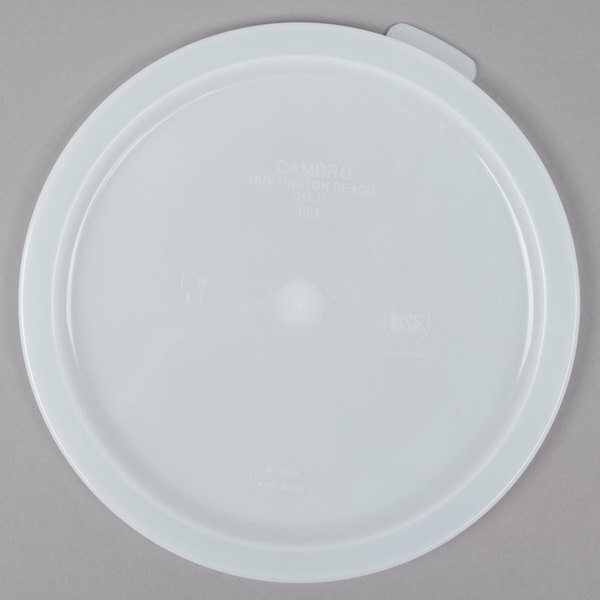 like all cambro branded lids, this round lid fits the round containers perfectly. 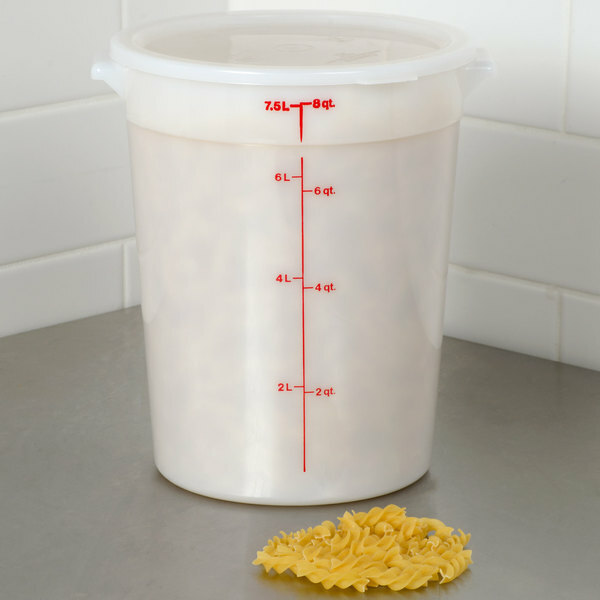 it's thick plastic (but not as thick or rigid as the lids for the square containers), and very inexpensive. The lid fits the food storage container perfectly. It pops off quickly and reseals quickly so access to food is effortless. It holds up very well over time. Making sure you have the proper lid to fit a container is important. This lid is made of strong plastic and seals up nicely. Fits a 6 QT Cambridge containers easily. WOW. A very strong and very nice lid. Cambro is a great company with great stuff. It clean very easy, and it does not stain.